And how many is that? Microsoft held its annual shareholder meeting this morning and while we're sure it was exhilarating to hear CEO Steve Ballmer rattle off cash flow figures, there were some interesting tidbits to pick up. Notably, Ballmer told the gathered group that Windows Phone 8, though young, is already helping the Softies sell four times as many phones as it did this time last year. What Ballmer didn't specify was exact figures - something we've been lacking from the company in general when it comes to its new Windows 8 platform and the hardware packing it. We learned Tuesday that Microsoft managed to sell 40 million Windows 8 licenses since the OS's debut Oct. 26, but other than that, the numbers for devices like the Surface tablet are missing. 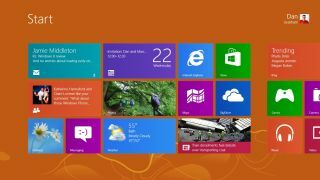 Ballmer also reported that the number of Windows 8 PCs has grown to 1,500, with new devices scheduled to go on sale "in the coming weeks." He claimed that the Windows Phone Store has more than 120,000 apps and that soon the company will hold 46 of the top 50 apps people use. Windows 8 is apparently also outpacing Windows 7 upgrades and with all the mud being slung at W8 from nearly every angle, it's good to hear some positive news coming out of Redmond.